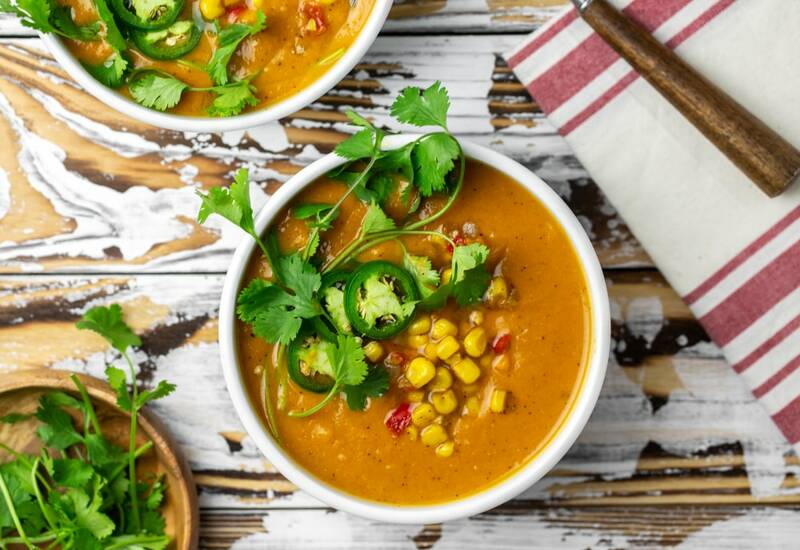 Corn, red bell pepper, and sweet potatoes come together in this creamy and comforting soup, perfect for fall evenings or your Thanksgiving table. Jalapeño pepper adds a touch of heat to keep you warm. It is ready in about an hour, thanks to the pressure cooker! Serve with your favorite toppings such as fresh cilantro, chopped jalapeño, cheese, Mexican hot sauce, or sour cream. Heat butter in pressure cooker set to Sauté on Normal. Sauté onion, red bell pepper, jalapeño pepper, and garlic until onion is translucent and peppers are soft, about 5 minutes. Stir sweet potatoes, corn, and vegetable broth into onion mixture. Press Cancel. Add salt, pepper, cumin, chili powder, paprika, chipotle powder, and bay leaves to sweet potato mixture. Remove bay leaves and place half the soup in a bowl and blend until smooth with an immersion blender. Return blended soup to pot and turn on pot to Sauté on Low. Add heavy cream and cook for 10 minutes. Make a big batch on Sunday and ladle into individual containers and store to the refrigerator for lunch during the week. Per Serving: 711 calories; 30g fat; 108.3g carbohydrates; 13g protein; 83mg cholesterol; 1334mg sodium. This soup was so good! On it's own, it was delicious, but I had quite a bit left over and we didn't want soup days in a row. So I wouldn't waste it, I figured this would be a somewhat healthy sauce. I made this soup a base for sauce for baked enchiladas! My mom and I loved it. I definitely recommend giving this one a try especially since it can be utilized for another recipe later. First time making a soup with sweet potatoes and it's crazy delicious. The best part is the jalapeño pepper to complement the southwest flavors. I impressed myself, I didn't know I could make something so good at home! Followed recipe exactly and this was delicious! Got rave reviews from everyone. I used a large jalapeño and added half the seeds...it was perfect for my crowd but might have been too spicy for some. Great texture and depth of flavors. Will definitely make again!